Euro zone leaders made Greece surrender much of its sovereignty to outside supervision on Monday in return for agreeing to talks on an 86 billion euros bailout to keep the near-bankrupt country in the single currency. "Clearly the Europe of austerity has won," Greece's Reform Minister George Katrougalos said. "Either we are going to accept these draconian measures or it is the sudden death of our economy through the continuation of the closure of the banks. So it is an agreement that is practically forced upon us," he told BBC radio. If the summit had failed, Greece would have been staring into an economic abyss with its shuttered banks on the brink of collapse and the prospect of having to print a parallel currency and in time, exit the European monetary union. He dismissed suggestions that Tsipras had been humiliated even though the final euro summit statement insisted repeatedly that Greece must henceforth subject much of its public policy to prior agreement by bailout monitors. Tsipras himself, elected five months ago to end five years of suffocating austerity, said he and his team had "fought a tough battle" and had to make difficult decisions. He said he had secured an improved promise of debt restructuring and "averted the plan for financial strangulation". That will only happen if he can meet a tight timetable for enacting unpopular reforms of value added tax, pensions, quasi-automatic budget cuts if Greece misses fiscal targets, new bankruptcy rules and an EU banking law that could be used to make big depositors take losses. Asked whether the tough conditions imposed on a desperate Greece were not similar to the 1919 Versailles treaty that forced crushing reparations on a defeated Germany after World War One, she said: "I won't take part in historical comparisons, especially when I didn't make them myself." Some diplomats questioned whether it was feasible to rush the package through the Greek parliament in just three days. Tsipras is set to sack ministers who did not support his negotiating position and make dissident lawmakers in his Syriza party resign their seats, people close to the government said. Even if this week's immediate rescue succeeds, many EU diplomats question whether an unstable Greece will stay the course on a three-year program with a return to intrusive quarterly monitoring on the ground in Athens. Options included releasing European Central Bank profits on Greek bonds, tapping an emergency fund run by the European Commission, or bilateral loans from friendly countries such as France. Two French sources denied any bridging loan was planned. The ECB was expected to maintain emergency funding for Greek banks to keep them just afloat this week but no large increase was likely and the banks would need a major recapitalization before they could reopen, central bank sources said. The deal calls for Greeks, already reeling from harsh measures and economic decline, to cut back even further in exchange for more loans without which its financial system would surely collapse. The deal, which still needs approval from Greece's parliament, will be the country's third bailout in five years. Both sides acknowledged the bitter disputes that kept the leaders at odds for months, and kept them negotiating nine hours past a Sunday midnight deadline. German Chancellor Angela Merkel said that along with the deal, "trust needs to be rebuilt." "Greece has a chance to return to the path of growth," she said, but "it will be a long road." 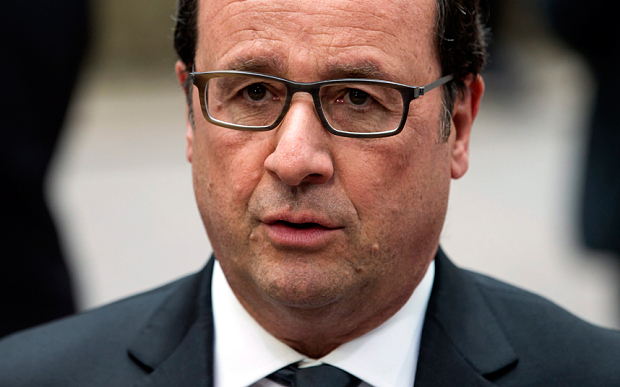 French President Francois Hollande said it was a path well worth taking. He said the Greek parliament would convene within hours to adopt the reforms called for in the plan, and he celebrated Greece's continued membership in the euro. For the eurozone to have lost Greece, Hollande said, would have been to lose "the heart of our civilization." Tsipras had been holding out for a better deal to sell to his reluctant legislature in Athens this week, even as financial collapse grew closer by the day. A breakthrough came in a meeting between Tsipras, Hollande, Merkel and EU President Donald Tusk, after the threat of expulsion from the euro put intense pressure on Tsipras to swallow politically unpalatable austerity measures. "We took the responsibility of the decision to be able to avert the harshest outcome," Tsipras said. "We managed to avert the demand to transfer Greek assets abroad, to avert the collapse of the banking system." The deal includes commitments from Tsipras to push a drastic austerity program including pension, market and privatization reforms through parliament as soon as possible. In return, the 18 other eurozone leaders committed to start talks on a new bailout program. A Cypriot official said the creditors would look into bridge financing for Greece later Monday, suggesting that the deal could pave the way for the European Central Bank to extend emergency liquidity assistance to Greek banks. Without it, they risk running out of cash this week. The official spoke only on condition of anonymity because he was not authorized to discuss the deal publicly. Greece had requested a three-year, 53.5 billion-euro ($75.9 billion Cdn) financial package, but that number grew larger by the tens of billions as the negotiations dragged on and the leaders calculated how much Greece will need to stay solvent. The leaders of the eurozone estimated the needs of Greece to stand somewhere around 85 billion euros ($120.5 billion Cdn). Greece has received two previous bailouts, totaling 240 billion euros ($340.3 billion Cdn), in return for deep spending cuts, tax increases and reforms from successive governments. Although the country's annual budget deficit has come down dramatically, Greece's debt burden has increased as the economy has shrunk by a quarter. The Greek government has made getting some form of debt relief a priority and hopes that a comprehensive solution will involve European creditors at least agreeing to delayed repayments or lower interest rates. Greek debt stands at around 320 billion euros ($453.7 billion Cdn) — a staggering 180 per cent or so of the country's annual gross domestic product. Few economists think that debt will ever be fully repaid. Last week, the International Monetary Fund said Greece's debt will need to be restructured. European leaders in Brussels reached a third bailout deal for Greece on Monday morning, after more than 17 hours of talks on the thorny subject of reforms and more financial aid for the near-bankrupt country. The president of the European Union, Donald Tusk, tweeted to confirm the news (click on image below). Bond yields in Italy and Spain fell to session lows on the news and the euro reversed earlier losses to hit $1.11725. The pan-European Stoxx 600 index was trading around 1.6 percent higher. In a press conference Monday, Tusk said "we have an agreekment" and said both sides had agreed in principle "to start negotiations on an (European Stability Mechanism) ESM program, which, in other words, means continued financial support for Greece." "The decision gives Greece the chance to get back on track with the support of European partners," he added, but said there would be "strict conditions." European Commission President Jean-Claude Juncker added that there would be no "Grexit" (a Greek exit from the euro zone) as a result of the deal, while the head of the Eurogroup of finance ministers, Jeroen Dijsselbloem, said talks would continue over the details of the bailout. Speaking to reporters after the deal, Greek Prime Minister, Alexis Tsipras, said the most extreme reform plans had been averted, and the country had endured a big struggle for the last six months. He added that the deal's implementation would be difficult, but allowed Greece to return to growth. A key part of the agreement is that a 50 billion euro ($55 billion) fund will be set up using Greek government assets. This will be used to help pay down the country's debts and refinance its banks. Dijsselbloem said a panel of experts would decide which assets will be used and how the funds will be monetized - either through privatization or re-investment. Some 25 billion euros of the fund are expected to be used to recapitalize Greek banks, which have been operating under capital controls for over a week. Although the apparent agreement helps quash fears that Greece could be heading for a euro zone exit, there is some skepticism that Greek Tsipras can get the reform measures passed through parliament. Reforms required of Greece include an overhaul of its pension system and widespread sales tax rises that could face opposition in the parliament, although there are reports that Tsipras could expel any rebels within his Syriza party that don't back the measures. Despite the apparent capitulation of Greece to lender demands, the Commission's President Juncker was keen to point out that no side had been humiliated by the deal. "There are no winners and no losers. I don't think the Greek people have been humiliated and the other European governments have not lost face. It is a typical European agreement," he said. In the end, facing a banking collapse and social unrest, Greece caved to creditors and accepted very harsh reforms in exchange for a third bailout. There was no Grexit but France and Germany went at it, exposing some profound disagreements within the eurozone. Greek Prime Minister Alexis Tsipras still has to pass these reforms through parliament by Wednesday but I'm confident he will get enough support within his party and from opposition leaders to ram them through. Amid growing discord, the proposal was condemned by Mr Hollande, who is Greece’s last ally in the debt talks and who has pledged to do everything to keep the country in the currency. “There is no such thing as temporary Grexit, there is only a Grexit or no Grexit. There is Greece in the eurozone or Greece not in the eurozone. But in that case it's Europe that retreats,” he said. Hollande was right to call out German Finance Minister Wolfgang Schaeuble's proposal for a Greek "timeout" from the eurozone as irresponsible and dangerous (my former colleague Brian Romanchuk disagrees but I don't think he understands what a temporary Grexit means for the Greek economy). Former Greek Finance Minister Yanis Varoufakis also came out swinging during the weekend, stating "Germany won’t spare Greek pain – it has an interest in breaking us." In his first interview since resigning, Varoufakis says the Eurogroup is “completely and utterly” controlled by Germany, Greece was “set up” and last week’s referendum was wasted. Varoufakis might be right on Germany's control over the Eurogroup but he fails to acknowledge his own grave mistakes which made a dismal economic situation into a full-blown catastrophe. Amazingly, he admitted he was looking for Grexit and return to the drachma from day one on the job, which makes him a traitor in the eyes of many Greek and rightfully so. The arrogance of Varoufakis never ceases to amaze me. This guy suffers from delusions of grandeur and exhibits traits of severe narcissistic personality disorder. I'll state this again, Alexis Tsipras and Yanis Varoufakis will go down in history as the worst PM and FM Greece has ever known. Francois Hollande might publicly praise Tsipras's courage but the reality is that the SYRIZA government was completely and utterly incompetent and reckless in managing the Greek economy. The damage inflicted on the Greek economy over the last two weeks is unprecedented and a direct consequence of their gross incompetence and reckless behavior. But as much as I detest Tsipras, Varoufakis, and SYRIZA, I'm equally unimpressed with Schaeuble and Merkel. The lack of real leadership from Germany is a testimony that something is profoundly wrong in the eurozone and until they deal with serious structural flaws of this union, it's only a matter of time before another euro crisis erupts. Europe’s bizarre decision-making structure has allowed domestic German politics to prevail over all other considerations. And that has meant less interest in an honest resolution of the crisis than in avoiding the appearance of being lenient toward Greece. Germany’s leaders might rightly fear that their country will be left holding the bill for European bailouts, but the result has been to sacrifice Greece on the altar of an abstract and unworkable idea: “no bailouts.” Unless some rational compromise is agreed, insistence on that approach will lead only to massive and even more costly defaults. Many Greeks wrongly blame the Greek Orthodox Church. There were plenty of Greeks who told me that the Greek Orthodox Church pays no taxes on its huge real estate holdings. My uncle in Athens set the record straight: "The Church gave away 92% of its vast real estate holdings to the government during the crisis in order to make priests get paid a token amount as civil servants. These priests have many children and are not paid well, often dying in poverty. The Church (and other charities) pay full taxes on their remaining real estate holdings and they do a lot of great work which the media doesn't cover to help thousands of poor and disabled Greeks. Come with me to the church down the street and I will show you many ladies volunteering their time to cook meals for desperately poor families. They do this for free because it's part of our faith." Of course, my uncle is a good Christian who pays all his taxes and volunteers his time to countless charities, including visiting prisoners who were jailed for illegally crossing the Greek border. My uncle was a successful self-employed businessman who imported and exported leather products and other products and happily worked well past the age of 67. He was actually still working traveling around Europe and very active up until recently with many charities, including driving disabled people to the bank to pick up money and visiting illegal immigrants in jail who didn't speak Greek to help them navigate the system. A devout Greek Orthodox Christian and highly educated man, he was a member of the New Democracy party but very balanced in his political views which admittedly were market centered. I'm sure he would be glad to have known Greece signed a deal to remain in the eurozone but he always told me that no matter what happens, the country faces a long and arduous road ahead. As we put an end to this endless Greek debt saga, I want people to keep in mind Greeks like my uncle. There are ordinary Greeks and then there are truly extraordinary Greeks like him and others who quietly do their part in making Greece a much better country. As long as they are around, I remain optimistic on the prospects of Greece to come through any challenges that lie ahead. Below, French President Francois Hollande states the obvious, namely, "There is no stability without growth". He is absolutely right and unless eurozone's leaders tackle the growth paradox, the euro deflation crisis will only intensify and sink their economies further into debt. I don't believe this is over. Greece may get a temporary reprieve but only a matter of time for elections. Which maybe what the Germans want this way they may be able to get rid of Syriza and then offer a better deal to New Democracy or PASOK or if Syriza wins this time it will be on the platform of Grexit either way win win for Germany in their minds. The measures being asked will inflict too much pain, and we still have not seen any measure for stimulating the economy for growth. Once the tourism season is over (whatever can be salvaged) despair and gloom will set in. Those who didn't withdraw all their money from the banks will do so and we will continue in this bad loop. I believe it was an excellent outcome. All the noise about a coup etc is nonsense. All the anti Europeans are making sensationalist comments about Germany which is a cheap target. Greece was asked to implement all the things that they had agreed the past 5 years but never implemented. Yes they have to do it within 2 days but this is a Greek problem. They procrastinated for a long time. For example one of the demands is to implement a law that was passed in 2010 wrt pension reform. The law was there but was ignored by successive admins. Now with respect to the 50bln euro fund, it is a joke. This was placed there by Europe in order to appease their own electorates. There are NO 50bln worth of assets in the privatization fund. At most you can find 10-15 within the next 10 years. They are making too much fuss about it. The one think that is grey is how they are going to handle the bank recap. I am at a loss how it can be done without bail-in. Overall if they implement the demands Greece can look to a better future. Of course the extend and pretend would continue. We offer our sincere condolences on the death of your uncle Taki. He sounds like a remarkable man. This is a heartbreaking situation for the Greek people and we hope that better days may come. There is ample blame to go around for this catastrophe (to invoke an appropriate Greek word) and no one wants to make harsh judgments or kick those who are down, including many who are blameless. But I think it has to be said that the Greek people, with all their admirable qualities, have monumentally mismanaged and misgoverned their own beautiful country for many years. If they had wanted to stay out of the hands of foreign creditors, this course was open to them; but it would have entailed social and political reforms they consistently refused to make. With their fantasy politics they themselves foreclosed that possibility. Nemesis isn't always just, but she always turns up sooner or later. I thank everyone who provided their valuable feedback. As I wrote to John Legere, my uncle Taki would have agreed with him and so do I. With this third bailout, Greece is effectively giving up its fiscal sovereignty in order to remain part of the eurozone, and given its history of fiscal mismanagement, that's not necessarily a bad thing.